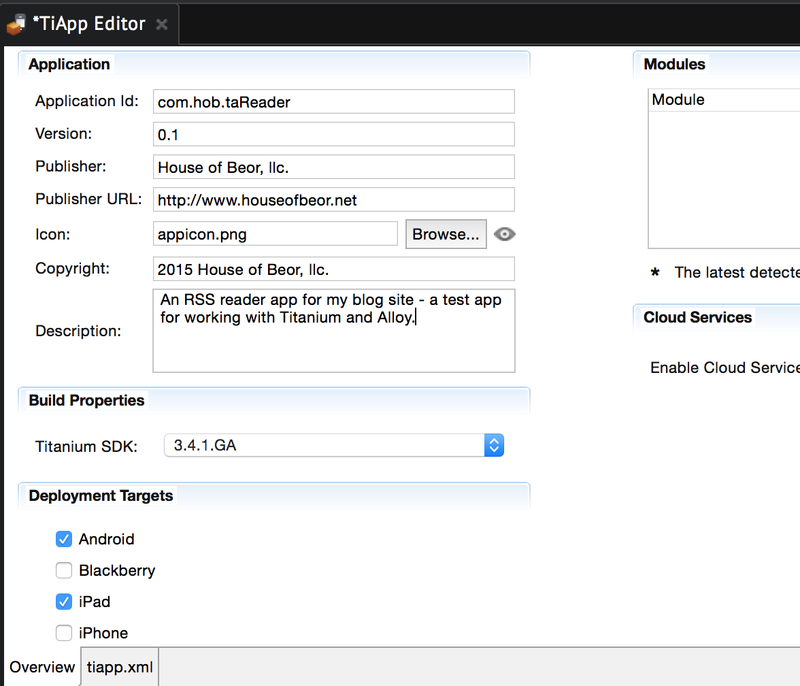 I’ve experimented with Appcelerator Titanium in the past, but did not find a place for the tool with the work I do. For the mobile development work I’ve been doing for a few years, user experience is the most important thing and with Titanium I could just never get quite there with it. Its been a while and now I have a few apps to build where UX is not the most important thing. 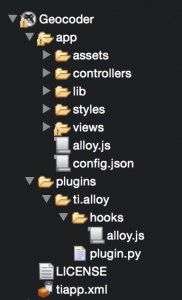 Working on iOS and Android is the most important – so in this post I’m going to comment out on the latest Titanium, their new to me MVC architecture, and give my thoughts on the developer IDE, GUI layouts, and in general if the tool is going to meet my cross-platform needs. Getting studio installed and working was pretty simple. I already have XCode and Android Studio (with the latest SDK) installed on my MBP. If you don’t then it will take you a bit longer to get all that stuff installed and working. I did also go thru the steps to get the command line tools working, including the Alloy MVC kit working from the command line. The docs for all of this are pretty good. I see right away there’s some decent code-lookup functions that work nicely. So if you are a crazed perfectionist, like me, you will probably notice that Studio runs on JRE 1.6 and you will possibly also spend 3-4 hours trying to figure out how to get it working on 1.8. Well – don’t…it won’t…so give up. Its odd, but again…Eclipse…I think is losing some steam…Android studio has no issues on 1.8..ah well. 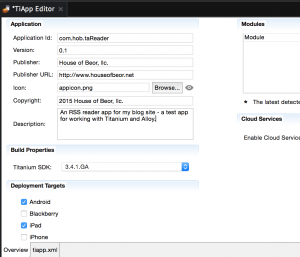 http://docs.appcelerator.com: The main docs site. The samples are also useful. One thing to note is that if you want to get the Alloy samples you need to get them from Studio – Window –> Show View –> Samples. The links from the docs site are not the right links to the Alloy versions. In general I do find it hard to look thru the various places and know which version of Titanium SDK is being talked about. However the docs are significantly improved. Model View Controller (MVC) patterns can certainly make development for manageable and sustainable, but sometimes the overhead can outweigh the benefits. 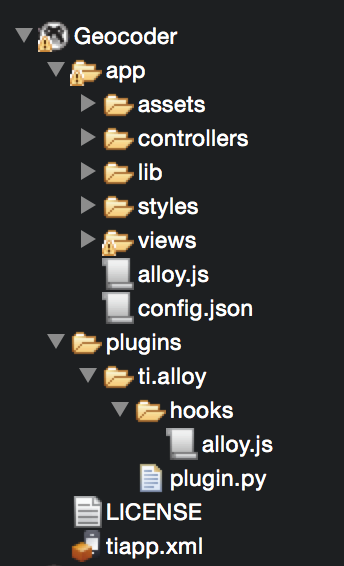 With Alloy you can a pretty typical structure of models, views, and controllers. 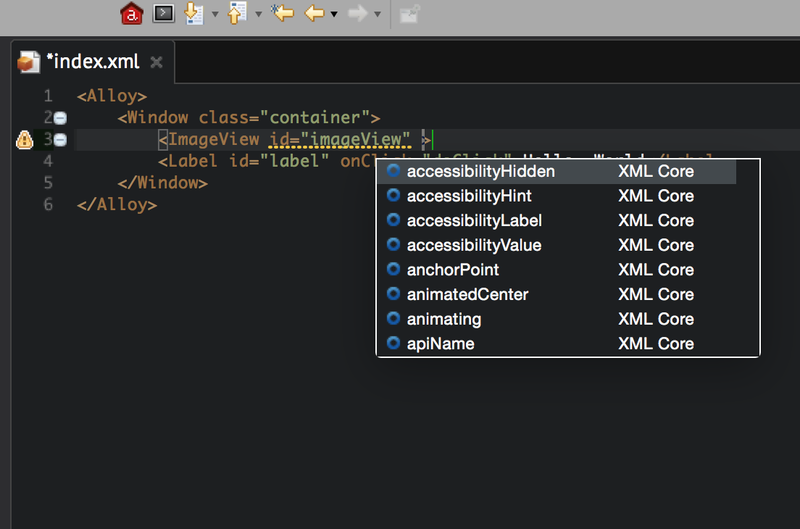 The docs and samples are pretty light, but this blog post helps out quite a bit and even has a “ruble” that can add a new template to Studio to help get going with the right setup for your app. The concept of the ruble is pretty cool too – that’s something new for me with Eclipse. The code is not yet available so stay tuned for that. Models – looks interesting, but I’ve not done a ton with backbone.js (more of an angluar.js guy) so I will have to check into that. The data binding stuff looks very interesting. backbone.js and underscore.js: Looks pretty interesting, but they are behind in their support for the latest so I’ll have to see how that impacts how easy it is to learn about these tools. Change up the UI with better style, fonts, etc. to match my site. Build an actual model that represents the XML feed data. Instead of going to a web view, implement a real viewer for the content – ok this is pretty ambitious so we’ll see about it – lol. Add in a few other screens and such so that it looks like a complete app. Build a version for a tablet – maybe an iPad Mini. 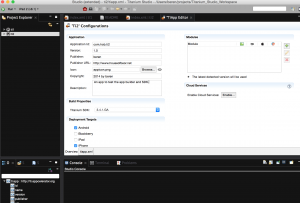 There are references to what must be global vars that allow you to test for what platform you are running on. Deploy it – I’m using a Nexus 5 running Lollipop – and bingo. Seems to work, except there are some formatting issues – the sample screen shots had images, but there are no images. I had a hard time getting Studio to find my device. I had to first get Android Studio to deploy something and then go back and do it in Titanium – prior to that my device was not listed in the available run target list. Little glitch – and could just be me. No worries after that it seems to work all the time.